How much does it take to make an effort in doing something? Everything we do (well, almost) even sleeping, takes effort. We will only put in effort in doing something when the interest sparks with momentum. 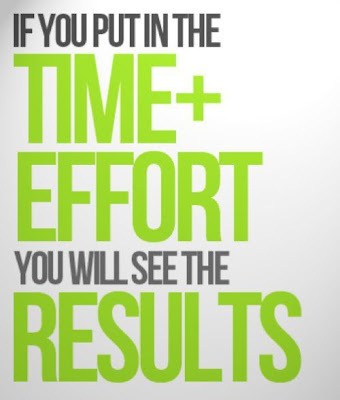 To put it simply, you will only put in effort in doing something when you personally want to do it, sans excuses. I strongly believe luck cannot replace effort. When we want something, we don't wait for luck to make it happen. We have to work for/at it to make it happen. It can be tough or even discouraging. But who the eff cares? Unless you're an indecisive person, it shouldn't be a challenge but a goal. Don't let anyone dull your sparkle. Even if a thousand people tell you it's not worth to put in so much effort, to hell with them. Win or lose, you have to face it yourself. At least if you fail, you don't let yourself down because you put in the effort. If you succeed, you did not let your effort go to waste. Now that R and I are going through a long-distance marriage commitment, it's not easy, I tell you. Especially when a kid is involved. BunBun is still too young to understand why Papi has to go "far far away" to work and will constantly ask me when's Papi coming home. Even though she seems like she doesn't really give a hoot about whether R is home or not, I caught her a couple of times going into my room and walk towards R's cleaned-out work desk and she will look at our wedding picture hung up on the wall. Quietly, she'll walk out of my room and continue with whatever she's doing. The effort we, as husband and wife has to put in is more than what we put in whilst together in Singapore. Emotional effort is the toughest of them all. Imagine going to sleep and waking up alone after so many years of seeing "the" face. Suddenly, everything changes. You don't have to cook so much, you wash lesser clothes and you don't talk so much anymore. I'm lucky to be still staying with my mother who can keep me sane. I have frustrations inside me but I know as long as I put in the effort needed on my part (and hopefully more), things won't be bad after all. It's just a matter of time. So to mothers out there who are going through long-distance marriage like me, or single mothers out there.. we have to put in the effort to keep on going cos' we have to be thankful to God for keeping us alive for our kids and family. If you think your life is like crap, remember there's someone else's life far worst than you. We have to tell ourselves ,"it's all for a better tomorrow". Mothers are tough cookies so remember even if no one supports you, God is there. Put in some effort today to make someone smile. It can be anyone. It can be anything.